Bake 20 to 25 minutes or until toothpick inserted 2 inches from side of pan comes out clean. Transfer to cooling rack to cool completely, about 1 hour. Freeze in pan 30 minutes. Using foil to lift, remove brownies from pan, and peel foil away. Use 3-inch round cutter to cut out 8 brownie rounds. Use 1 3/4-inch round cutter to cut out smaller rounds from remaining brownie. Set aside leftover pieces for snacking. 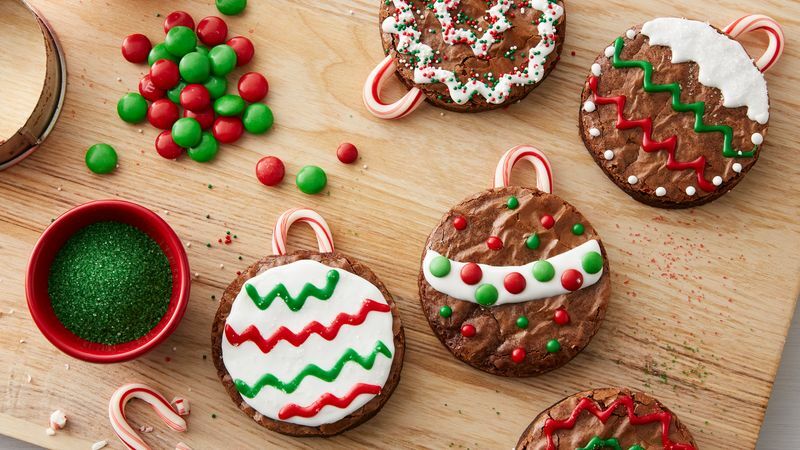 Cut hook off each candy cane; unwrap, and use to create hooks on brownie circles. Reserve remaining pieces of candy canes for another use. Decorate as desired using icing, sprinkles and candies. Let stand about 30 minutes or until icing is set. Store covered in airtight container at room temperature with waxed paper between layers.